Will US stocks fall further in April? Stocks had kicked off the second quarter in red as fears peaked on global trade wars. Last month, the markets had seen President Donald Trump’s new tariffs plan on steel, aluminum, and Chinese imports, changes in White House, Broadcom-Qualcomm deal end, Amazon’s tax treatments, Facebook data leak scandal, inflation and economic report, and interest rate hike. 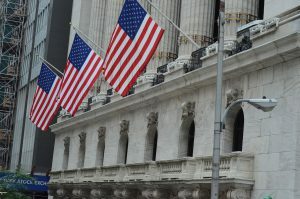 Will the stocks remain a permanent citizen in red-zone this month? Trump had suggested a new imports tariffs plan of 25% on steel and 10% on aluminum. Trump suggested countries such as Canada, Mexico, and Australia could be exempted from tariffs. The president was considering imposing tariffs on up to $50 billion of Chinese imports in the technology and telecommunications sectors. The president also blocked Broadcom’s (AVGO) $117 billion proposed takeover bid of Qualcomm (QCOM) on national security grounds. Also, Trump intends to go after Amazon.com (AMZN) and wants to change Amazon’s tax treatments as mom-and-pop retailers are being put out of business. Facebook (FB) chief Mark Zuckerberg’s plan to testify before the Congress in the wake of the Cambridge Analytica scandal also remained a concern last month. Economic advisor Gary Cohn had submitted his resignation for protesting against the imports tariff plan. The president fired Rex Tillerson as US secretary of state. Trump appointed Larry Kudlow as his top economic advisor, replacing Gary Cohn. John Bolton was appointed as national security adviser, replacing H.R. McMaster. Last month, the Labor Department data showed that non-farm payroll employment climbed by 313,000 jobs in February after rising 239,000 jobs in January. The unemployment rate held at 4.1% in February. Another report revealed that consumer price index rose 0.2% in February after rising 0.5% in January and core consumer price inflation slowed to 0.2% in February from 0.3% in January. A Commerce Department report revealed that gross domestic product grew 2.9% in the fourth quarter after increasing 3.2% in the third quarter. The Federal Reserve decided to lift interest rates by 25 basis points and hinted at three rate hikes in both 2018 and 2019. The Fed based the rate hike to annual inflation, which is likely to move up in the coming months, and economic outlook that will likely grow 2.7% in the fourth quarter instead of 2.5% earlier expected. The Fed sees its benchmark rate to hit 2.9% by the end of 2019 compared to prior expectations of 2.7%. The Federal Reserve decided to lift interest rates by 25 basis points and hinted at three rate hikes in both 2018 and 2019. 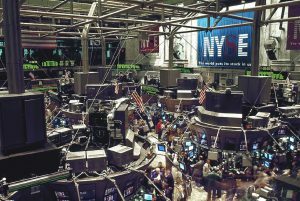 In March, the S&P 500 had declined 1.87%, the Dow Jones Industrial Average had tumbled 1.77%, and the Nasdaq Composite index had fallen 2.68%. The markets were mostly worried about the trade war concerns. Historically, April has been a strong month for stocks, according to the Stock Trader’s Almanac. The markets might focus on March employment report, trade deficit, vehicle sales and a number of Fed speeches. Moody’s Capital Research expects nonfarm employment to have risen by 155,000 from February to March as the weather will be a temporary drag, and the jobless rate to have fallen from 4.1% to 4%. Moody’s also sees a broader nominal trade deficit in February due to Olympics, which boosts broadcasting and licensing fees imports. Weather is also expected to drag vehicle sales lower in March. Investing in shares has been less preferred as more newly popular sectors are popping out, including marijuana, cobalt and lithium, and blockchain. Also, base metal companies, royalty and streaming companies too remained investor favorites. The markets plunged on Monday, April 2 — the first trading day of this month — on trade war concerns. China said it is imposing a 15% tariff on 120 American products such as fruits, nuts, wine and steel pipes, as well as a 25% tariff on eight other U.S. products, including pork and recycled aluminum. It has been just a day since the start of second quarter. Let’s hope to utilize this negativity properly and turn them positive.